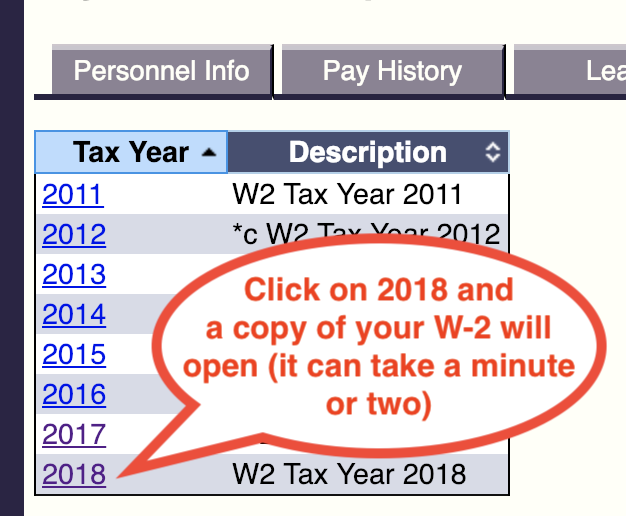 2018 W-2 forms are available online. Physical copies will be mailed soon. The information is read-only – there is no way to change the information. If you need to change your address or other information contact Human Resources. Your W-2 will be mailed to the address shown. This is not the place to change it. If you have moved, fill out a change of address form in the HR department. Your absence certificate information is only as accurate as the certificates that have made their way to the HR department and been entered. For example, if you take a week vacation, and submit the Absence Certificate on the day you return, it will take a some time for your supervisor to sign the Absence Cert and then for it to get to HR and be entered. To begin, you must establish an account in the Employee Self-Service server. After your account is created, you can return at any time by just clicking on login. NOTE: ESS is slow, so be patient as you go through each step. Your employee ID number. You can find your employee number on your direct deposit slip or or your pay stub. To begin registration, go to https://ess.berkeley.net:29295. You can click on the link, or copy and paste the URL into Google Chrome or another web browser. If this is your first time on the site, click register. Note: Next time you visit, you will click login. In the next window you create your account. You only have to do this step once. Then, enter your desired login name and password. Use something you will remember. 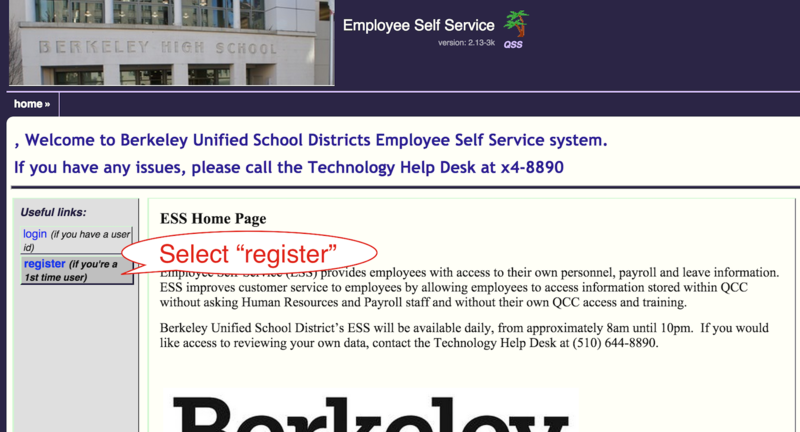 You may want to use a login similar to your @berkeley.net account. Make sure you store your password in a password manager or your phone so you don’t forget it. If the information is entered correctly you will be directed to a login page as shown below. Your username should automatically appear in the username field along with “staff” for the “User Type” and you can then enter the password that you just created and then select the “login” button. If everything is entered correctly you will be directed to the ESS homepage shown below. Click on My Info on the left hand side below the picture. The tabs provide read-only access to the data. Address information is from the system; contact HR to change. Leave information may not reflect recent absences. The six Tabs are: Personnel Info, Pay History, Leave, W2/ACAs. (The other tabs are not active.) Click on the W2/ACA tab. Then click on 2018 to open the PDF of your W-2. ESS is slow — be patient, especially this time of year. You can then print or save your W-2. Next time you visit, you will click login rather than register. Enter your email address to receive an update whenever there is a new blog post on our website. Enter your email address to receive our biweekly email newsletter in English or Spanish. Complaint forms are available at school sites and on the district webpage at www.berkeleyschools.net/complaints. More information is available at www.berkeleyschools.net/non-discrimination/.